This post has been one I've been wanting to do for a while now. I think yellow is a hard color to style and some of you agreed when I wore my yellow skirt last week. So I decided to share some of the ways I've sworn yellow yellow to help with some inspiration. After all, you need to feel confident in a color to wear it well, right?! 1. Yellow as a bottom. 2. Yellow as a top. 3. Yellow as an accessory. Are you looking to add yellow to your wardrobe? Check out my picks below-most under $50! you look amazing in yellow dear..
Yellow is a great color and suites you well. Beautiful selections and great stlying. Yes, yellow can be difficult to wear, but your outfits are great! I love your bright yellow skirt! It looks fabulous! Thank you for sharing these! 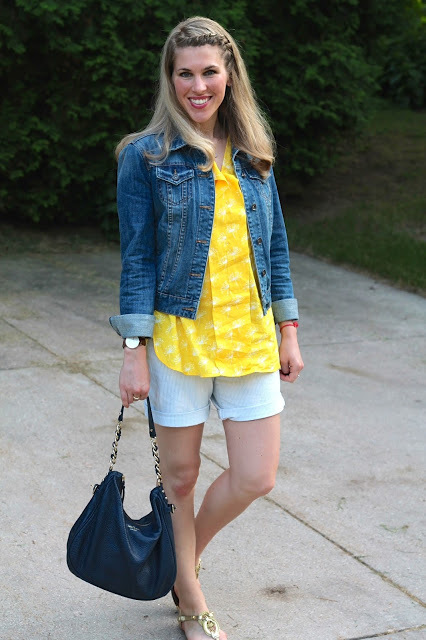 You've done a beautiful job demonstrating that yellow can in fact be a versatile color to have in your closet. It's such a happy color too, so who wouldn't want some yellow in their wardrobe?! Yellow can be hard to wear, but it's a fun color to wear. You wear it so well. So much inspiration! You wear yellow so well! I need to add some yellow pieces to my closet! Yellow really is a fabulous color on you! I am a huge fan of yellow, but can only wear it in mustard tones unless of course I choose an awesome yellow accessory! So much wonderful inspiration in this post. Thanks for sharing! Such a great guide, lady- you look lovely in yellow! How cute - you really do rock yellow! I always shy away from yellow, but you are making me reconsider. You wear it so well! Yellow is definitely a great color on you Laura! Most shades aren't flattering near my face, but mustard and super bright yellows seem to work. I love how you have shown yellow in such a variety of ways. It's such a cheery color and you have made me want to dig through my closet to find ways to wear my yellow pieces! Thank you for the inspiration! It's really my favorite color lately!! I think I could do this post too--I think I've worn it most of the ways you have...although I don't have a pink striped skirt and I think that's my fave combo! It's so bright and unexpected!! To me yellow is a happy color---at least it makes me smile looking at it, so I have to believe it makes others feel that way! Wow, I LOVE this bright color on you! So summer chic! You look like a happy bright ray of sunshine in yellow! Thanks for hosting, Dear! I love wearing yellow, it always make me so happy. Love all of your looks! You wear it so well. I love the different ways to style, such a beautiful and happy color. Yellow can be such a hard color to wear, so I appreciate all this inspiration for outfits with yellow! I love all of your yellow skirt looks especially, as well as the one with the yellow stripe top, shorts, and sneakers. I think yellow is great on you!! Yellow really suits you! Love that color on you! Lovely looks! I bought the cutest yellow top this past string and have been having such a hard time styling it. I tried it with black (looks like I'm a bumble bee), white, and navy blue. I wore it with white skinny jeans and navy jeans so far. I love the way yellow looks with grey and pink as you have shown and I will have to give that a try too. I do agree, yellow can be so tricky! I do love it with navy, mint, and grey. Yellow can be really hard to wear. I like the yellow skirt paired with the lemon print top. I think yellow is such a pretty color, especially for summer, and have been adding more of it to my wardrobe. I really like the variety of ways you have shown to style it! I just realised I do not have a lot of yellow in my closet. I always tend to think it washes me away. You wear it very well. I love your grey sleeveless top over yellow shirt look a lot. I never thought to pair those two together. Cute! I literally never wear yellow! So many great ideas, I love the color on you! Thanks for sharing! I love all of this yellow!! You look stunning in it! I wish I could incorporate more of it in to my wardrobe. Love every look! 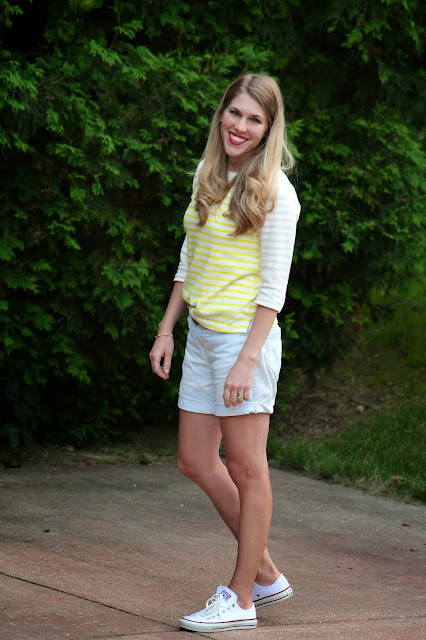 So many great ways to wear yellow! I love your many yellow outfits! I am starting to like yellow now! Wow, what great looks! I have a yellow skirt and a yellow clutch that I've had for years, but they've started to "get dusty." This is motivating me to pull them back out and mix them up a bit!! You sure know how to rock the color yellow. You can do yellow amazingly! I love the gray and yellow combo! I think I shy away from yellow pieces because I don't have too many of them. I especially love your yellow striped top! You are so adorable! I love your style. My skin is pretty pink and my hair is red, so I'm not sure I could handle yellow unless it was an accessory (I do have some pretty cool yellow earrings). I'm jealous though because you look fabulous in it! Laura, I love all the ways you've styled yellow! Thanks for sharing this pretty! Great post! I have a yellow skirt so this is great inspiration! all great ways to wear yellow and you look great in it! Good gravy, woman...so many cute ways to wear this bright color. Love the yellow and gray. Maybe I should keep yellow away from my face? My mother would certainly say so! Or the yellow with the pink skirt. So precious. And that darling yellow striped tee. That would be a good yellow option for me! Great options.